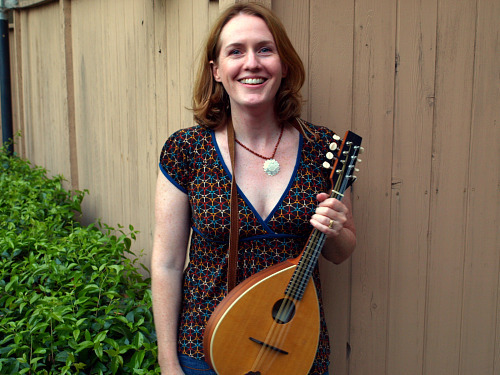 So I'm getting ready to traverse the entire U.S. of A. with my family and I've decided that instead of bringing my fiddle and risking that it turns into a puddle in the trunk, I'm going to bring along my mandolin. Thus, I dug out my dusty mando and set about resurrecting it today. I still had a gift card that a student had given me last Christmas, so I took my mandolin to my local music store, Old Town Music, where I was able to buy an entire set of strings -- eight of them -- for $4.50! Then for another $10, they strung it for me -- nice. What a shock, after spending something like $79 on four new strings for my violin last week, and of course, when has anyone strung an instrument for me, since I was 12 years old? During the reinging, we meandered to the back of the store, where I looked through some books, hoping to find something that would work for me, the classical violinist. It's not easy; I find mandolin tablature to be unnecessary and unfamiliar, just plain difficult to read! And I don't really need the super-basic "this is the A STRING..." kind of book. Yet, I'm a beginner on mandolin: A left-handed person who has only trained my right hand to use a bow. Pick technique is a new challenge, and though I want some instant gratification, I need just the right thing to help me develop this new technique. As is typical, I was thumbing through everything, frowning, concentrating, brow furrowed, finding nothing, when my son, Brian, popped up with, "How 'bout this one, Mom?" Hmmm, Sam Bush Teaches Mandolin Repertoire and Technique...The music is all written out, there's a little CD, the notes are fairly basic but considering the pick issue, it promises some challenge...Looks good. So I'm all set up, and after listening to a bit of the little CD, Sam seems like a good teacher. And heavens, he seems like a good player! P.S. For his efforts, I spent the rest of my gift certificate on a harmonica for Brian -- he's not going to bring the piano in the car, either! You can't get any better than Sam Bush. He is a super talent--good pick! BTW he plays the fiddle too! You must see him in a live setting when you get the chance. Of course I thanked them! Always! Actually, I'm feeling like it will really help my right hand, and help it for violin playing. Specifically, I'm currently working on Bach Sonata No. 2, and in the final movement, I want to do some of the 32nd notes un-slurred, as Bach indicated. But it's not as fast as I'd like. So I'm thinking, if I can get pickin', and if I can also get a good tremolo (which is rather different than a bow tremolo), this will help. One of the greatest living bluegrass music players is Ricky Skaggs. He can take anything with strings on it and make it sound great. You can see and hear him play here. I need to "second" Ricky Scaggs. Yeah, I love Ricky Skaggs. I believe that was also Bobby Hicks on fiddle in that video---one of the very best. Be prepared for your callouses to toughen up, Laurie. Two courses of strings and much higher tension will do that. I knew a mandolin player who had callouses so thick you could see through them! You could also use this as an opportunity to practice learning by ear! Clever title ;-) Sounds like fun! But I don't get the image of the violin turning into a puddle . . . I'm sure your violin isn't the wicked witch. Have fun with the mando. Be careful with the left hand, as the strings tend to be less forgiving. Have fun! I second Ann, plus if you pass up a Cheese Cake factory you'll be begging God's forgiveness for a year! Ricky Scaggs Yes! I would also add Roy Clark but a couple of people who met Roy in public said his ego was bigger than Texas (sigh) sorry Roy! Shucks, aint you got no cotton-pickin' banjo ? ?